We always pay for our airline tickets with our credit card, and this entitles us to standard insurance cover. However, this cover does not include lost baggage insurance and so I take a top up for Dave and I. The reason for this is that to replace our clothes overseas would cost a fortune as not only is one Rand worth 5 pence, clothes are more expensive in England and Europe than here. Thankfully, up until this previous trip, we’ve had no reason to claim. Our luggage has been delayed (and we are covered for that), but never lost. Ash clouds have lifted timeously for us to not miss any flights and we’ve never (touch wood) had to visit a hospital in a foreign country. But, on our way out of France in May, Dave was pick pocketed in the men’s bathroom at Charles de Gaulle airport. It took us over an hour to report the theft and then I had to go about filling in claim forms and collating documents for the insurance claim. It took them from May until August to pay us out. The delay was totally unacceptable in my opinion, and I’m only grateful we lost cash after our holiday, and not at the start. 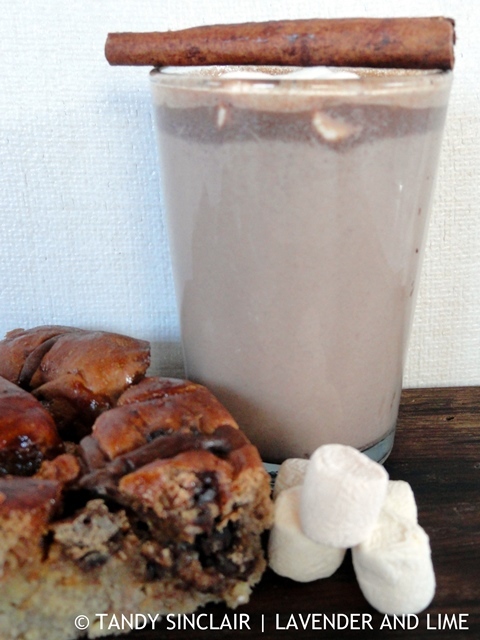 Something worth the delay is infusing the milk to make this hot chocolate. Your patience will pay off in a delectable comforting cup of decadence. Oh Tandy, Sorry about the pick-pocket incident. I am very glad it happened towards the end of the vacation and not the beginning. I love hot chocolate. My mom made it for us all winter long. We were given huge containers of it for Christmas, with the recipe and often the ingredients. It is one of those gifts I miss most. It is such a nuisance if something gets stolen, especially abroad! Oh, delicious hot chocolate! As we go into Autumn here in NY, the thought of a nice warm cup of chocolate sounds wonderful. Sorry to hear about being pick pocketed. I can’t even imagine. It was not fun at all! What a nuisance for you – especially being made to wait so long for the return. I was in a position to test our our travel insurance last year after a major trip while getting out of a cab in Pisa, Italy. Fortunately our insurance company was very good to us – as I saw doctors every week in 3 different countries. I’m so sorry to hear about the pick pocketing incident. That’s terrible. I love hot chocolate, especially with marshmallows. Lovely hot chocolate, love the cinnamon! So sorry about the pick pocket! uh… pick pocketing is so annoying…So sorry to read about that. The chocolate looks great though!I love the idea of infusing the milk before! Sounds like a winning hot chocolate! Knock on wood to nothing has happened to me too but sorry you two and a bad experience, thankfully at the end. Both myself (Barcelona)and my mom (Toulouse) were almost pick-pocketed but we caught them in the act so nothing happened. That is so lucky Evelyne! UGH – so sorry to hear Dave was pick-pocketed – and about the delay! I gotta agree – it seems totally unacceptable and pointless! But let’s focus on this – because with cooler months – chocolate in drinkable form becomes a favorite around our home! People always look at me in horror when I tell them that I drink hot chocolate ALL YEAR ROUND (yes, even in summer!) so Im always looking for new recipes for home made hot chocolate! This looks amazing – ill deffinately be giving it a go! This hot chocolate is just the ticket when you’ve been pickpocket-ed. I’m so sorry you had to go through all that! The warming of the cinnamon is a must try idea though! We always buy extra insurance just in case. We’ve only had to use it once and for two reasons. 1. The Australian airline we purchased the tickets through went out of business and all our tickets were invalid. 2. It was September 11th, 2001 and we were on the runway at Dulles airport in DC. It cost the insurance company nearly $26,000 for the four of us to finally get home. Delays, extra hotels, flights that were horrendously expensive and more. 🙂 Worth what we paid for in insurance fees. I love hot chocolate on a cold night. It’s really cold, windy and rainy tonight and decidedly un-Springlike. I might infuse some milk with a cinnamon stick and have a go at this. Maureen, that must have been a scary place to be in right then! Hi Tandy, oh a pick pocket, that is like something out of the movies, how horrible. Love hot chocolate…..any time of day! It was not fun to say the least! Mmmm – delicious – Tandy and what nuisance Dave getting pick pocketed but as you say at least it was at the end not the beginning of the trip. So sorry to hear about the pick pocket incident at CDG. What a bummer! This hot cocoa looks FAB! I like to sit at home on rainy evenings and consume comfort food and this will absolutely be on the list. Hopefully the rains will start soon in California!